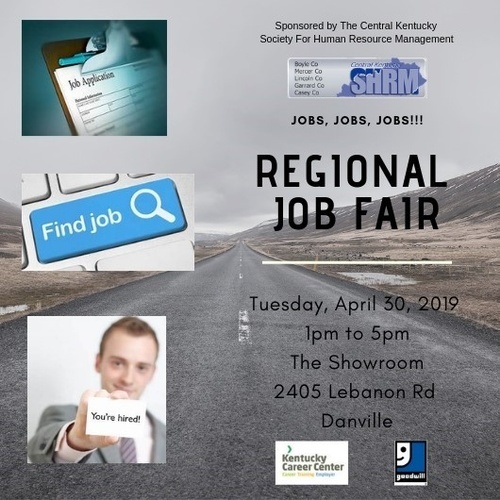 CKSHRM chapter will be hosting an upcoming Regional Job Fair on Tuesday, April 30, 2019. This event will be held at The Showroom 2405 Lebanon Rd in Danville from 1pm to 5pm. The job fair will be open to any interested employer. CKSHRM members will be able to attend with no registration fee. There will be an area for job seekers to work on resumes and utilize laptops for online applications. Setup time will begin 12pm for registered employers and doors will open to job seekers at 1pm. There will be light refreshments available for employers and a Caribbean Spice food truck will be parked at this event selling food. Email registration forms to Bill Pianovski at bpianovski@ckycareers.com. Deadline to register is Monday April 15th, 2019. The Regional Job Fair is being held in partner with the Workforce Development Committee?s Community Resource Fair on April 25th. This event will be held at The Showroom 2405 Lebanon Rd in Danville. The Regional Job Fair will take place on Tuesday, April 30, 2019 from 1pm to 5pm.